With experience in fisheries policy and management, economic impact evaluation, and education and training, Pacific Catalyst team members will work to provide policy analysis that may be useful to organizations such as the Forum Fisheries Agency, Pacific Community and other established institutions, to enhance both the sustainability and value of marine resources. Their work will focus on tuna fisheries to begin, but could eventually involve nearshore fisheries as well. "Through USP we will support the next generation of students and professionals who will manage Pacific fisheries for years to come," said founding director Transform Aqorau. "Although Pacific Catalyst is just getting started, our team has over 100 years combined experience in fisheries education, science and policy-setting across the Pacific. Our advisors bring many decades of experience as well. What we all share is a very clear optimism that when we combine the energy of motivated students and forward-looking fisheries managers with innovative strategies, we can ensure the future health of our fisheries and Pacific island communities. Our research will help form the foundation of those strategies." A Snapshot of Rights-Based Management Provisions in the Pacific Islands: A 15-nation survey that examines the strength of rights based management provisions in offshore commercial fisheries and the extent to which customary fishing rights are recognized in national fisheries legislation. A Review of Regional Priorities Relating to Coastal and Offshore Fisheries: An in-depth review of policy documents, treaties and communiques, along with categorization of challenges relating to marine resources, fisheries management and coastal communities. The review identifies top priorities for capacity building and identifies crosscutting areas for regional collaboration. Understanding Potential Benefits of Enhanced Transferability of Fishing Rights: An initial assessment of the potential for Pacific Island nations to increase demand for the tuna fishing access rights they issue, through enhanced transferability between vessels and companies. The overarching goal is to inform Pacific Island countries’ efforts to optimize the value of rights without compromising the control the Pacific Islands have over tuna fisheries in their waters. Analysis of Costs and Benefits of Management Options for Fiji’s Longline Fishery: An evaluation of alternative fishery management approaches. Conducted in cooperation with the Fiji Fishing Industry Association and Ministry of Fisheries to help identify ways to optimize revenue for the domestic longline fleet. In addition to USP, Pacific Catalyst is currently supported by The University of Wollongong, Duke University’s Nicholas Institute for Environmental Policy Solutions, and Environmental Defense Fund. "We welcome inquiries from prospective students, fisheries officials, private sector fishing companies and from non-governmental organizations, especially those involved in tuna fisheries," said Salome Taufa, a Pacific Catalyst team member based in Suva, Fiji. "Tuna are an amazing life force in our ocean, one that we draw sustenance and inspiration from. Working together, we can help sustain that force for generations to come." 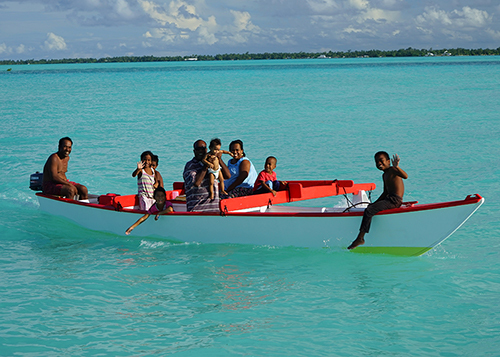 Pacific Catalyst supports achievement of regional oceanic and coastal fisheries goals and the emergence of a new generation of fisheries managers. Partners include the University of the South Pacific, the University of Wollongong, Duke University, iTunaIntel and Environmental Defense Fund. For more information please visit PacificCatalyst.org or email partners@pacificcatalyst.org.